Washington Square Press, 9781451609820, 352pp. What would you do if your husband suddenly wanted to rewrite all of the rules of your relationship? 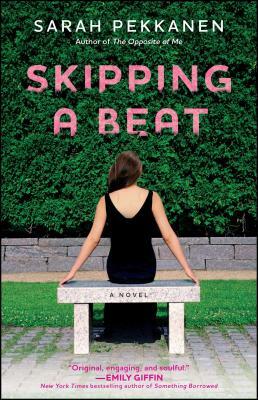 This is the question at the heart of Skipping a Beat, Pekkanen’s thought-provoking second book. From the outside, Julia and Michael seem to have it all. Both products of difficult childhoods in rural West Virginia – where they were simply Julie and Mike – they become high school sweethearts and fall in love. Shortly after graduation, they flee their small town to start afresh. Now thirty-somethings, they are living a rarified life in their multi-million-dollar, Washington D.C. home. Julia is a highly sought-after party planner, while Michael has just sold his wildly successful flavored water company for $70 million. But one day, Michael collapses in his office. Four minutes and eight seconds after his cardiac arrest, a portable defibrillator jump-starts his heart. But in those lost minutes he becomes a different man. Money is meaningless to him - and he wants to give it all away. Julia, who sees bits of her life reflected in scenes from the world’s great operas, is now facing with a choice she never anticipated. Should she should walk away from the man she once adored – but who truthfully became a stranger to her long before this pronouncement - or give in to her husband's pleas for a second chance and a promise of a poorer but happier life? When a teenaged Julie asks Mike where he sits in class, he responds, "I'm right behind you, Julie. I always have been." Does this statement remain accurate for their entire relationship? Why is Julia so reluctant to hear about Michael's near-death experience? "I had no doubt Michael would be successful, but as much as I loved him, as much as I wanted to, I couldn't bring myself to gamble on him." Why does Julia feel this way? Why does she insist on a prenuptial agreement? When Michael leaves Julia a card telling her that he loves her, she crumples it in her hand and thinks, "I wanted to hurt him. He was ruining everything." Considering how unhappy she is in their marriage, what exactly is Michael ruining? How did her parents' relationship affect the one she shares with Michael? Does Julia trust anyone? Michael is often described as jittery. Why does he seem to never stay still for very long? Michael senses that he doesn't have much time left. Does Julia believe him? Why does she have nightmares that she is losing him? Throughout the novel, Julia frequently mentions her favorite operas. Why are they so important to her? What significance do you see in Noah's restaurant riddle? Michael frequently laments that success changed him for the worse, from taking risks with the exploding glass bottles to the "Let's see you bastards ignore me now" checks for his family to Scott's law- suit and the many other examples of hush money. Do you agree that money changed him? Was he always a good man, or did power truly corrupt him? What do you think the future holds for Isabelle and Beth? Will they stay in touch? "'I never went with you to visit your mother.' This is what Michael and I had been heading toward ever since he'd fallen to that conference room floor, I realized." Why is it so important for both of them to visit Julia's mother? Why does Julia confess her affair to Michael? Why had they never discussed Michael's assumed affair? What does giving her jewelry to Michael symbolize? Does this decision mean that Julia wants to stay married? At the novel's end, why does Julia return to her father's house? Does she forgive him? Discuss how things could have been different if Michael had never collapsed in the conference room. Would he still be married to Julia?